Microsoft has yet again included the infamous hidden Administrator account in Windows 8 Consumer Preview. Here’s how to enable the administrator account the easy way. Just like its predecessor, Windows 8 has a hidden built-in administrator account. By default, this account is disabled. But if you have administrator access, turning it on is easy. On the Metro Hom escreen, Type: lusrmgr.msc and press Enter. It’s a little strange at first, but that is how search works in the Metro UI. Just start typing and it automatically opens up. Alternatively, if you’re on the desktop, you can press they Keyboard Shortcut Windows Key+ R on your keyboard to open the Run menu and type it in. Lusrmgr (Local Users and Groups Manager Snap-in) comes up. Open the Users folder, then right click on Administrator and select Properties. 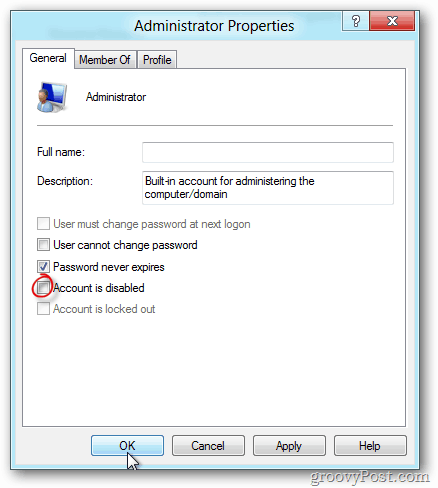 In the Administrator properties uncheck Account is Disabled. Click OK. Done! The Windows 8 Administrator is now enabled and you can immediately sign in with it by logging out or switching accounts. @Charlie: You can count on that! this only works in PRO or Enterprise editions, not the Windows 8 Core version which is what I have installed on the new laptop…. when I open up lusrmgr.msc it says this is disabled and its all blank inside shows no accouts, then it says to use the user accounts in control panel to configure users and there is no way to enable the default Admin account. @disqus_HL2BTsKyFh:disqus That’s interesting, I guess I didn’t try the core version — Thanks for the update! I found a way that works……..
You need to run the command from an elevated command prompt. Press the Windows key to get into the Metro interface if you are not already there. Enter cmd and right-click on the Command Prompt result that should appear. This opens a list of options at the bottom. Select Run as administrator there. Once you have enabled the account, you will see it listed in the user accounts control panel applet. Have you tried the command line method? didn’t work for me either, asks for an admin password and the admin account is disabled. Maddening. This is very frustrating and dumb. I deleted my admin account by mistake so I only have a local account. None of the steps work because I need an admin account to begin with which I don’t have because I deleted it by mistake. Should I wipe my whole hard drive clean? did you get an answer to this? I have the same problem.. I know It is frustrating. But Please have patience. You can proceed. Microsoft is here to help you out. This is incredibly frustrating. I am attempting to active the Administrator’s account so I can start using my new computer. I open the run box, enter cmd, get the dos box. Run as administrator (by right clicking as instructed) does not appear to work? What am I doing wrong? thx. Many thanks but I tried & can’t access prompted; if someone can assist? If you only have a guest account you need to REINSTALL! Its a security messure by microsoft!